For other uses, see Effigy (disambiguation). "Effigies" redirects here. For the punk group, see The Effigies. An effigy is a representation of a specific person in the form of sculpture or some other three-dimensional medium. The use of the term is normally restricted to certain contexts in a somewhat arbitrary way: recumbent effigies on tombs are so called, but standing statues of individuals, or busts, are usually not. Likenesses of religious figures in sculpture are not normally called effigies. Effigies are common elements of funerary art, especially as a recumbent effigy (in a lying position) in stone or metal placed on a tomb, or a less permanent "funeral effigy", placed on the coffin in a grand funeral, wearing real clothing. Figures, often caricatural in style, that are damaged, destroyed or paraded in order to harm the person represented by magical means, or merely to mock or insult them or their memory, are also called effigies. It is common to burn an effigy of a person ("burn in effigy") as an act of protest. The word is first documented in English in 1539 and comes, perhaps via French, from the Latin effigies, meaning "representation". This spelling was originally used in English for singular senses: even a single image was "the effigies of ...". (This spelling seems to have been later reanalyzed as a plural, creating the singular effigy.) In effigie was probably understood as a Latin phrase until the 18th century. The word occurs in Shakespeare's As You Like It of 1600 (II, vii, 193), where scansion suggests that the second syllable is to be emphasized, as in the Latin pronunciation (but unlike the modern English pronunciation). The best known British example of a caricature effigy is the figure of the 1605 Gunpowder Plotter Guy Fawkes, found in charge of gunpowder to blow up the King in the House of Lords. On November 5, Guy Fawkes Night or Bonfire Night, his effigy, typically made of straw and old clothing, is still traditionally burned on a bonfire in many villages accompanied by fireworks. In many parts of the world, there are traditions of large caricature effigies of political or other figures carried on floats in parades at festivals. Political effigies serve a broadly similar purpose in political demonstrations and annual community rituals such as that held in Lewes, on the south coast of England. In Lewes, models of important or unpopular figures in current affairs are burned on Guy Fawkes Night, formerly alongside an effigy of the Pope. Caricature effigies, in Greek skiachtro (pl. skiachtra, σκιάχτρο / σκιάχτρα), are still in use to prevent birds from eating mature fruit, mainly grapes. In Oriental Orthodox, South and Latin American Christianity, populace used to burn or explode an effigy of Judas, just before Easter or on New Year's Eve. Now it is considered an obsolete custom and there are currently no attempts at revival. The display of temporary or permanent effigies in wood or wax sculpture and other media of the deceased was a common part of the funeral ceremonies of very important people over a long stretch of European history. They were shown lying on the coffin at the funeral, and then often displayed beside or over the tomb. The figures were dressed in the clothes of the deceased; only the face and hands needed to be modeled. The museum of Westminster Abbey has a collection of English royal wax effigies reaching to Edward III of England (died 1377), as well as those of figures such as the prime minister Pitt the Elder, the naval hero Horatio Nelson, and Frances Stewart, Duchess of Richmond, at her own request and expense, who also had her parrot stuffed and displayed. From the time of the funeral of Charles II in 1680, effigies were no longer placed on the coffin but were still made for later display. The effigy of Charles II was displayed over his tomb until the early 19th century, when all effigies were removed from the abbey. Nelson's effigy was a tourist attraction, commissioned the year after his death and his burial in St Paul's Cathedral in 1805. The government had decided that major public figures with State funerals should in future be buried at St Paul's. Concerned for their revenue from visitors, the Abbey decided it needed a rival attraction for admirers of Nelson. In the field of numismatics, effigy has been used to describe the central image or portrait on the obverse of a coin. A practice evident in reference literature of the 19th century, the obverse of a coin was said to depict “the ruler’s effigy”. The appearance and style of effigy used varies according to the preference of the monarch or ruler being depicted - for example, some, such as George VI of the United Kingdom have preferred to be shown uncrowned, while others have favoured highly-formal representations. It can also be the case that the monarch's reign becomes long enough to merit issuing a succession of effigies so that their appearance continues to be current. Such has been the case for Queen Victoria (three effigies over 63 years) and Elizabeth II, who has been depicted by five different effigies on British coins and three different effigies on British postage stamps since she ascended to the throne in 1953. In the past, criminals sentenced to death in absentia might be officially executed "in effigy" as a symbolic act. 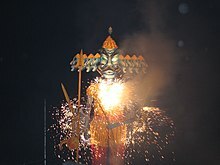 In southern India, effigies of the demon-king Ravana from the epic poem the Ramayana are traditionally burnt during the festival of Navrati. The term gisant (French, "recumbent") is associated with the full-length effigies of a deceased person depicted in stone or wood on church monuments. These lie on their backs, with hands together in prayer. An Effigie of a deceased person that is kneeling in prayer is called a priant. Effigies may also be (half) demi-figures and the term is occasionally used to refer to busts. The Marzanna ritual represents the end of the dark days of winter, the victory over death, and the welcoming of the spring rebirth. Marzanna is a Slavic goddess of death, associated with winter. The rite involves burning a female straw effigy or drowning it in a river, or both. It is a folk custom in Poland, Slovakia and the Czech Republic, taking place on the day of the vernal equinox. A Wicker man was a large human-shaped wicker statue allegedly used in Celtic paganism for human sacrifice by burning it, when loaded with captives. An effigy mound is a rather different term, used in the archaeology of (mainly) Pre-Columbian America for a large earthwork with a figurative design that is not obvious at ground level. A very rare wax funerary effigy of a private person, who stipulated it be made in her will, England, 1744. Holy Trinity Church, Stow Bardolph, Norfolk. ^ Westminster Abbey, "Horatio, Viscount Nelson". ^ Cuhaj, George S. 2012 Standard Catalog of World Coins - 1901-2000 (39 ed.). Krause Publications. pp. 333, 968, 991, 1523, and 1966. ISBN 978-1-4402-1572-8. ^ Cuhaj, George S. (2013). 2014 Standard Catalog of World Coins, 2001-Date (8 ed.). Krause Publications. pp. 152, 177, 179, 191, 225, and 655. ISBN 978-1-4402-3568-9. ^ The Encyclopædia Britannica: A Dictionary of Arts, Sciences, and General Literature. 17 (9 ed.). The Henry G. Allen Company. 1890. p. 630. ^ Hilsdale, Cecily J. (2014). Byzantine Art and Diplomacy in an Age of Decline. Cambridge University Press. p. 169. ISBN 978-1-107-03330-6. Look up effigy in Wiktionary, the free dictionary. Wikimedia Commons has media related to effigies.